There is something special about the fall cocktail. Seriously, summer gets all the attention for glam pineapple juice drinks and paper umbrellas, but fall drinks have a depth, a warmth that is often overlooked. Now, I’m not one to drink mixed drinks often, usually only while entertaining, so I don’t tend to have favorite “go-to” fall cocktail recipes. 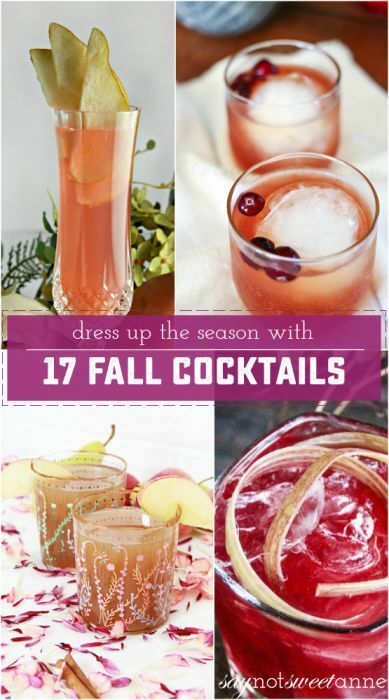 At least, I didn’t before I went scouring for this list of 17 amazing Fall cocktails! Now I have this whole list, and I can’t wait to try out each one. The theme for these fall drinks is obvious. There’s apple, cinnamon, cranberry and more. The flavors remind us of mulled wine and spiced hot totties – the perfect way to keep the chill away while enjoying (responsibly!) with friends. If you want to make them extra-special, try it with my DIY Gin Kit as a gift or a tasting! Cranberry Whisky Cocktail by Kleinworth & Co.
Be sure to comment here and let me know which of these cocktail recipes becomes your new Holiday favorite – I’m sure you’ll find at least one in this list! Kayla, thank you for sharing such a great assortment of all the great cocktails to try, not only for fall but these look perfect for any season! Perfect refreshers!